Summa Metaphysica, David Birnbaum’s (quite read-able) 3-part philosophical treatise explicating his signature Potentialism Theory. Please see ScrollDown God and Evil, immediately followed by God and Good. 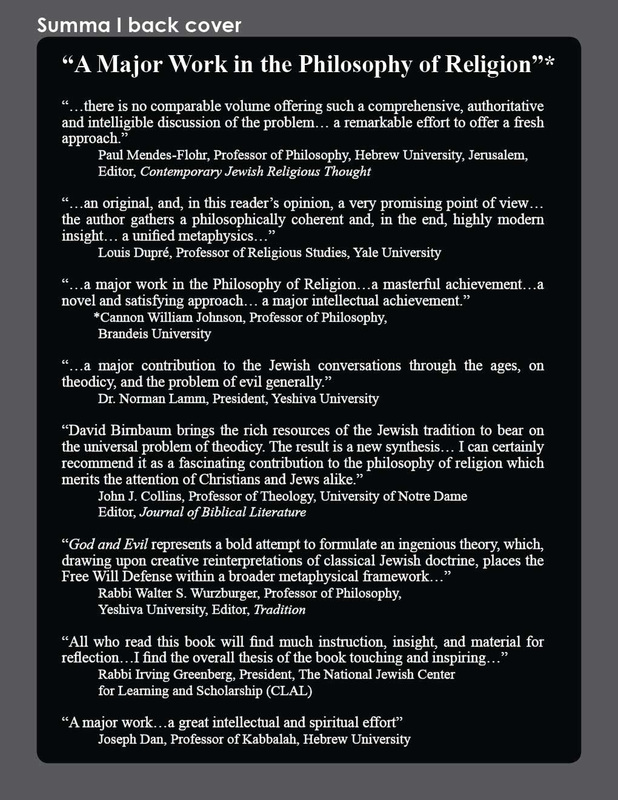 David Birnbaum’s God and Evil is a major philosophical study which systematically confronts the philosophical problem of evil, and the Holocaust in particular. It presents an extensively researched and comprehensive review of the subject. In a clearly presented and readable exposition, Birnbaum then proposes an original and powerful formulation. Combining modern and classic, rationalist and mystic themes, Birnbaum’s proposed solution to the ancient problem of evil is perhaps the most elegant to appear in modern times. Anchored biblically and philosophically, Birnbaum’s formulation proposes that two paths lie before humankind: The first, the path of dependence on God, which while leading to ultimate bliss, is humanly unsatisfying and unfulfilling. And the second, the path of maximum potential – in which the individual achieves fuller freedom and responsibility via a path fraught with considerable peril, although ultimately more potentializing. According to Birnbaum’s paradigm, Quest for Potential∞ drives Man and God and the Cosmos. Potential is the nexus. God of Potential is juxtaposed against Man of Autonomy, Freedom and Potential. Through proceeding from a Jewish context, Birnbaum’s compelling presentation and original synthesis will be of considerable value to adherents of all Western religious. God and Evil has been acclaimed by philosophers and theologians of all faiths. 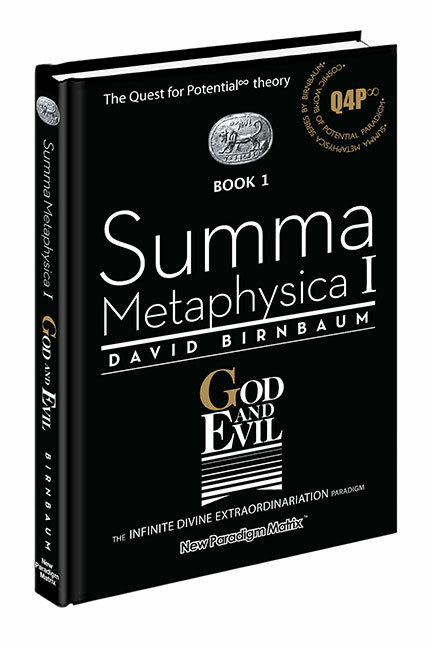 God and Evil (1988) is the first of two books in Birnbaum’s landmark two-volume Summa Metaphysica series crafted over a twenty-six year period. The second book, God and Good, was published in 2009 (on the web in 2005). In Book #1 of the series, the author introduces the concepts of Quest for Potential∞, as well as God of Potential. In Book #2 Birnbaum sculpts the concepts of Infinite Divine Extraordinariation, as well as focusing on The Potential∞ Point. 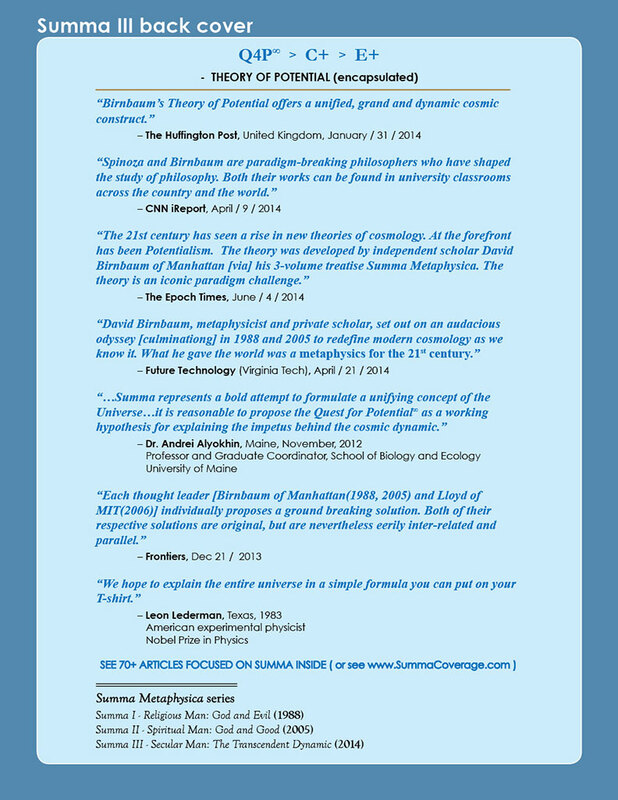 The Summa series re-shapes the contours of metaphysics, philosophy, and theology. Summa Metaphysica proposes a comprehensive and integrated metaphysical structure – a new paradigm. 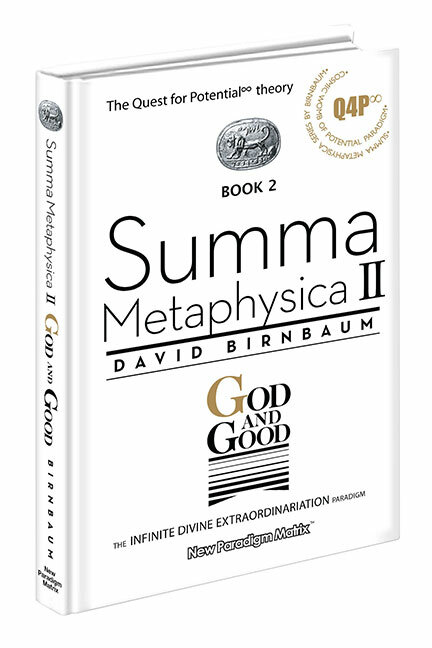 God and Evil (published 1988) and God and Good (first launched 2005 online) comprise Birnbaum’s Summa Metaphysica series. The author has proposed that one fundamental concept – and one fundamental concept alone – Quest for Potential∞ (recursive to the infinite power) – ignited – and drives – the cosmos – and the integral infinite divine. Building upon his 1988 treatise, in God and Good (18 years later) the author lays out his overarching metaphysical structure in very significantly greater scope, depth, breadth and texture. Birnbaum’s paradigm is non–linear, as opposed to the linearity of the great bulk of Western philosophy. It is non–circular, as opposed to the circularity of much of Eastern philosophy. Rather, Birnbaum’s paradigm is what the author refers to as a “spiral/reflexive” dynamic (elucidated in the text). The author proposes that this Quest for Potential∞ paradigm more elegantly explains the dynamics of the cosmos – and of life, in particular – than alternate propositions. According to Birnbaum, only the full plethora of potentials – and the quest thereof – could have ignited the cosmos. The combined potentials for love, life, intellectuality, spirituality and, indeed, for an infinitely Perfect Divine, ignited, birthed, nurtured, and projected the cosmos onward on its quest towards infinity. ‘Extraordinariation,’ according to the author, is the overarching goal. Thomas Aquinas wrote Summa Theologica c. 1273 within a Christian context. The Summa Metaphysica series, proposing an original, dynamic, overarching, and integrated metaphysics, is crafted within a Jewish context seven hundred years later. 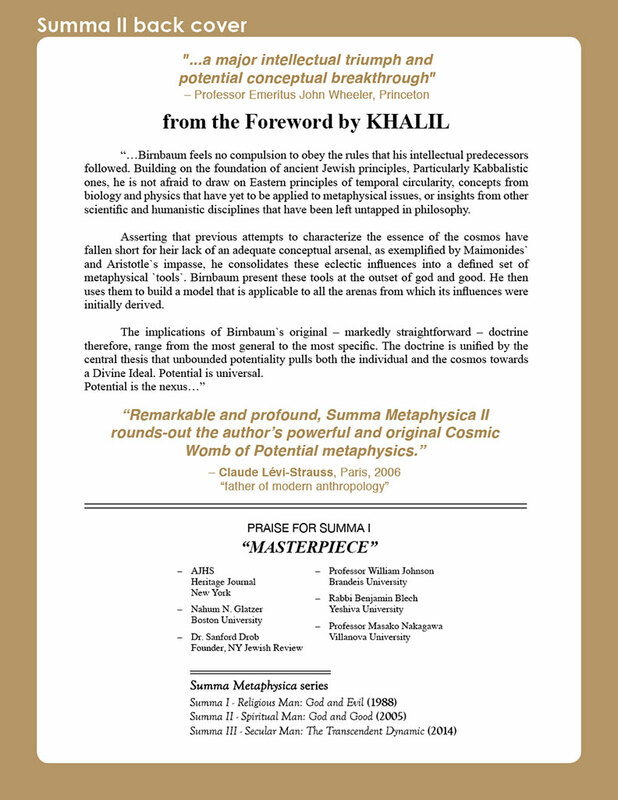 Summa Metaphysica proposes a comprehensive and integrated metaphysical structure – an original and powerful new paradigm. The author proposes that one fundamental concept – and one fundamental concept alone – Quest for Potential∞ (recursive to the infinite power) – ignited – and drives – the cosmos – and the integral infinite divine. Summa I: God and Evil: Religious Man(published 1988 by Ktav Publishing, NJ) develops the theme within a religious context. Building upon his 1988 treatise, in Summa II: God and Good: Spiritual Man (2005) the author lays out his overarching metaphysical structure in very significantly greater scope, depth, breadth and texture. Summa III: The Transcendent Dynamic: Secular Man (2014) lays-out the Potentialism metaphysics for Secular Man – delinked from any spirituality or religious aspects. The metaphysics is anchored in a creative finesse of science and logic. 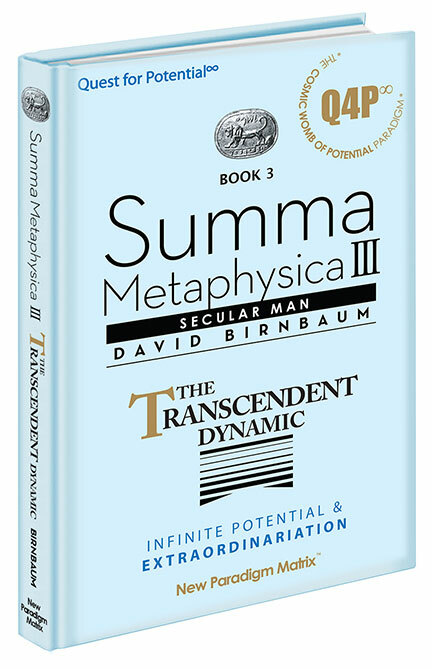 Summa Metaphysica develops the David Birnbaum philosophy of Infinite Quest for Potential.